In this scenario, you will learn more about Reactive Microservices using Eclipse Vert.x, one of the runtimes included in Red Hat OpenShift Application Runtimes. The audit - this is to keep a list of all our operations (yes, that’s the law). The audit component receives operations from the portfolio service via an event bus and address. It then stores theses in a database. It also provides a REST endpoint to retrieve the latest set of operations. In this first scenario, we will focus on creating the quote generator microservice. The quote generator is a simulator that generates the quotes for 3 fictional companies MacroHard, Divinator, and Black Coat. The market data is published on the Vert.x event bus. It also publishes an HTTP endpoint to get the current value of the quote. If you go on the Vert.x web site, Vert.x is defined as "a toolkit for building reactive applications on the JVM". There are a three important points in this description: toolkit, reactive and "on the JVM"
Also, Vert.x is event-driven and also non-blocking. Events are delivered in an event loop that must never be blocked. Let’s explain why. Unlike traditional, let’s say "enterprise", systems, Vert.x uses a very small number of threads. Some of these threads are event loops, they are responsible for dispatching the events in Handlers. If you block this thread, the events won’t be delivered anymore. This execution model impacts how you write your code, instead of the traditional model of blocking code, your code is going to be asynchronous and non-blocking. You might still want to ask: What kind of applications can I use Vert.x for? We say, Vert.x is incredibly flexible - whether it’s simple network utilities, sophisticated modern web applications, HTTP/REST microservices, high volume event processing or a full blown backend message-bus application, Vert.x is a great fit. It’s fast, and does not constraint you. Last but not least, Vert.x provides appropriate tools to build reactive systems; systems that are: responsive, elastic, resilient and asynchronous! In this scenario, you learned a bit more about what Reactive Systems and Reactive programming are and why it&apos;s useful when building Microservices. Note that some of the code in here may have been hard to understand and part of that is that we are not using an IDE, like JBoss Developer Studio (based on Eclipse) or IntelliJ. Both of these have excellent tooling to build Vert.x applications. You create a quote generator for 3 fictional companies and published a market data Verticle to the Vert.x Event Bus for other services to consume. You also published a HTTP endpoint that consumed the market data service and exposed a REST HTTP endpoint. In the next scenario, , we are going to implement a Portfolio service. A Portfolio stores the owned shares and the available cash. The sample project shows the components of a basic Vert.x project laid out in different subdirectories according to Maven best practices. 1. Build the parent POM. 2. 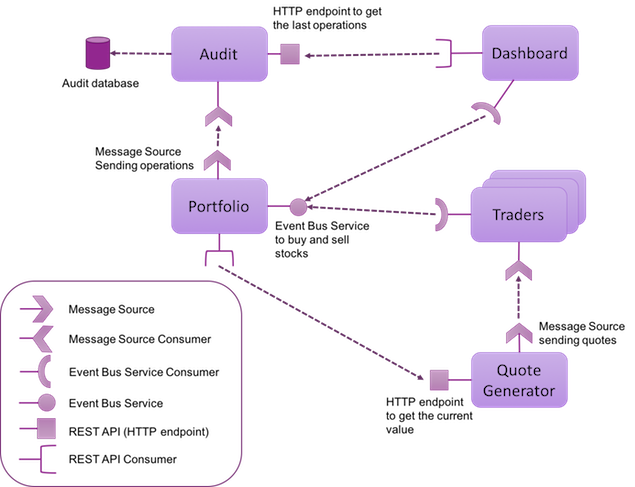 Examine the Quote Generator project structure. NOTE: To generate a similar project skeleton you can visit the Vert.x Starter webpage. If you have used Maven and Java before this should look familiar. This is how a typical Vert.x Java project would looks like. It consists of 3 Verticles. The GeneratorConfigVerticle generates the quotes for 3 fictional companies that are passed in the config src/conf/config.json. It uses MarketDataVerticle to publish the market data on the Vert.x Event Bus. The RestQuoteAPIVerticle Verticles provides an HTTP endpint to access the company quotes. As you review the content, you will notice that there are 3 TODO comments. Do not remove them! These comments are used as a marker and without them, you will not be able to finish this scenario. Verticles can retrieve a configuration using the config() method. Here it gets the details about the companies to simulate. The configuration is a JsonObject. Vert.x heavily uses JSON, so you are going to see a lot of JSON in this lab. For each company found in the configuration, it deploys the market data verticle with the extracted configuration. The next part in the method is about the service discovery mentioned in the microservice section. This component generates quotes sent on the event bus. But to let other components discover where the messages are sent (where means on which address), it registers it. market-data is the name of the service, ADDRESS is the event bus address on which the messages are sent. The last argument is a Handler that is notified when the registration has been completed. The handler receives a structure called AsyncResult. Finally, it deploys another verticle providing a very simple HTTP API. The first action is about creating a Handler, i.e. a method that is invoked on event. Click on the this link, which will open another tab or window of your browser pointing to port 35000 on your client. Let’s now launch the dashboard. Then, open your browser to this link, which will open another tab or window of your browser pointing to port 8080 on your client. Before moving on, press CTRL-C to stop the dashboard. Then switch back to the 1st terminal and press CTRL-C to stop the running application! In next step of this scenario we will deploy our application to the OpenShift Container Platform. Red Hat OpenShift Container Platform is the preferred runtime for the Red Hat OpenShift Application Runtimes like Vert.x. OpenShift Container Platform is based on Kubernetes which is probably the most used Orchestration for containers running in production. OpenShift is currently the only container platform based on Kuberenetes that offers multitenancy. This means that developers can have their own personal, isolated projects to test and verify application before committing to a shared code repository. 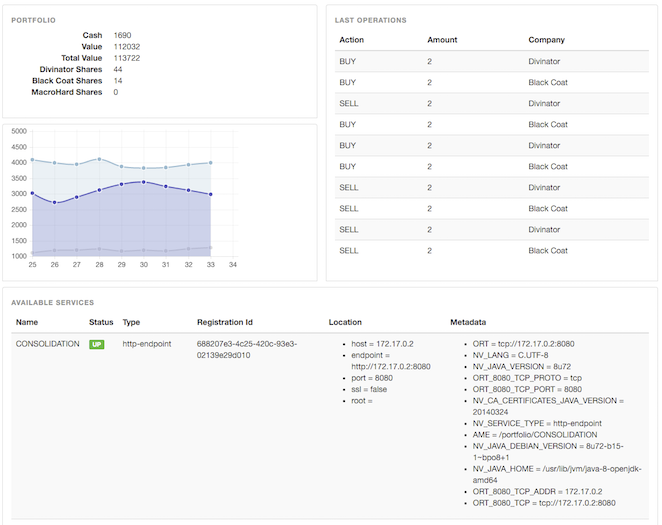 oc new-project vertx-micro-trader --display-name="Micro-Trader Application"
Red Hat OpenShift Application Runtimes includes a powerful maven plugin that can take an existing Eclipse Vert.x application and generate the necessary Kubernetes configuration. We have defined additional config, like quote-generator/src/main/fabric8/configmap.yml and quote-generator/src/main/fabric8/deployment.yml which defines the deployment characteristics of the app (in this case we mount a config file from a ConfigMap), but OpenShift supports a wide range of Deployment configuration options for apps). Click on the route URL to access the sample UI. You have deployed the quote-generator as a microservice. In the next component, we are going to implement an event bus service.